When it comes time to meeting with a lender, it is important that you have questions prepared instead of going into your mortgage process blindly. Mortgages are complicated subject that are comprised of multiple parts and as much as you try to educate yourself on the subject, your lender is still a human being. If they were to accidentally leave out some important details, which could cause you a lot of unnecessary stress if overlooked. To better prepare yourself for your mortgage process, we have compiled a list of questions that you should ask your lender. 1.What Mortgage Would You Recommend For Me and Why? Many lenders will right off the bat recommend a 30-year fixed mortgage to most homeowners, but many don’t know that there is actually more than one mortgage type. There is the Adjustable Rate Mortgage (ARM), 15-Year Fixed, a FHA Loan, and a VA Loan, which fits a multitude of personality and lifestyle types. Some mortgages also have different qualifying guidelines, so your lender will be able to tell you exactly which loans you qualify for. Automatically assuming that a 30-year fixed mortgage is the perfect product for you shows that the lender isn’t really looking at your financial situation and asking about your long term plan and therefore does not have your best interests in mind. Ask for a full break down of your mortgage. Ask your lender for the interest rate and do not be afraid to ask why that is your interest rate. Ask if you’ll be getting a fixed rate or an adjustable rate. Even if you have no knowledge of what kind of rate you are supposed to be getting, by having your lender explain to you the reason (you have a lot student debt, your credit score is great but not excellent, etc. ), it means that your lender is taking the time to actually see what they can do for you. 3. What Interest Rate Will I Be Getting? The journey from start to finish with your mortgage can take some time. It could even take up to several months to close your mortgage, but during the time span of several months, a lot can happen to interest rates. If you are with a lender that wants the best for you, they probably want you to get the lowest interest rate possible so that you can save the more of your hard earned money. Did you know that you can “lock” a rate? If you feel like rates are low and you want to secure it before anything else happens, you can opt to lock in that rate in order to avoid ending up with a higher interest rate when it is time to close. You may have to pay fees to guarantee this optimal rate for your loan, but it is not mandatory. 4. What Are Discount Points and Origination Fees? Lenders may or may not charge discount points or origination fees. An origination fee is a fee that lenders charge for originating the loan. A discount point is a fee that the borrower pays upfront to the lender at closing in exchange for a lower interest rate. For discount points, one point is equal to one percent of the loan amount. The best way to describe a discount point is to call it “pre-paid interest.” For example, if you were to take out a mortgage of $300,000 and want to pay 2 discount points, your fee will total to $6,000 (2% of $300,000). If you have been saving for quite some time and have a comfortable cushion fund and realize that having a lower interest rate for the duration of your loan is something that is a huge priority for you, paying discount points may be a good idea. While some people opt to worry about details later on down the road, there are others who want to play it safe and make sure they are setting themselves up for success in the future. There is no correct way to do this, it depends on what your priorities are. 5. What Are The Closing Costs? Closing costs/fees is what borrowers pay to the lender and the other parties that were involved in obtaining your home loan. Within three business days of receiving a loan application, a lender is required to provide a written breakdown of all the fees and costs. When talking about preparing for home ownership, many won’t realize that there are additional costs in addition to the down payment. Closing costs are usually between 2%-5% of the loan value, which can cost several thousand dollars. You can opt to have a no-closing-cost mortgage which basically means that your closing cost is absorbed into your mortgage. Your monthly payment will be higher since you have decided to add it to your overall home loan, but you will not have to worry about having to save more money in addition to the down payment you have worked so hard to save. 6. What Is The Total Cost Of My Mortgage? When you apply for a mortgage, you will receive a document within three days called a Good Faith Estimate (GFE) or a loan estimate. This important document will provide a thorough breakdown all of the fees that you would have to pay if you were to choose to move forward with this loan. A Good Faith Estimate includes an estimate for loan processing fees, interest rates, taxes, insurance, government fees, third party fees, prepayment penalty fees (if applicable), and the total closing costs. It is advised to shop around and compare different GFEs from different lenders to see who can offer you the best deal. Check to see if other lenders have omitted a prepayment penalty fee or given you a lower rate. These are important details that can save you a lot of money during the life of your loan. Please keep in mind that just because you receive a GFE from a lender, it does not mean you are guaranteed to get the loan. 7. Is There A Prepayment Penalty Associated With This Loan? Believe it or not, you can get slapped with a penalty fee for paying back your loan too quickly. A prepayment penalty fee is illegal in some states, so it is important to ask if this is something that comes with your loan. This information is disclosed and available in your contract, but you should be sure of this information before signing. Lenders have prepayment penalty fees because if the loan is paid back too quickly, they are losing money from the lack of interest. Make sure you ask your lender if there is a penalty for paying early and if there is, you can negotiate to have the penalty fee removed from the contract or simply ask for a different loan. 8. What Documents Do I Have To Provide? There are three main documents that you need and it can be a lot of paperwork. You will need to provide your proof of income and assets, personal identification and information about your credit history. It is absolutely imperative that this part of the process is done correctly because if you fail to provide some of the required mortgage documents, you could be turned down. Having a lender who is organized and put-together could also lessen the stress associated with finding all the necessary documents by keeping track of what has already been done and moving forward with the process. 9. 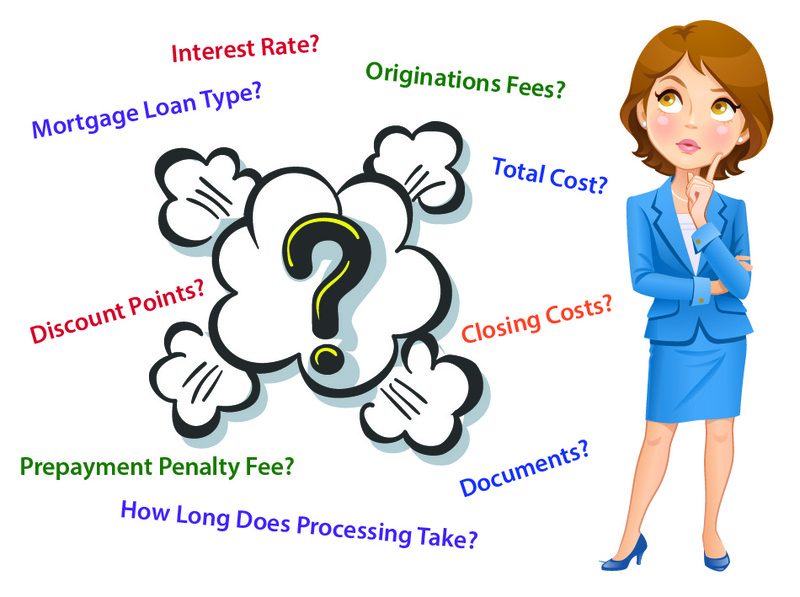 How Long Does It Take To Process A Loan Application? This answer is completely dependent on how quickly you can supply the required documents for your lender and how big his workload is as well as the other parties that are involved. It could take as little as a few weeks to as long as 60 days, but if you communicate with your lender and work together it will be as seamless as it can be. To avoid slowing down the process, there are some things you can do. You can do your part to fully complete all of the required documents, be prepared with an explanation for any past credit issues, don’t decide to switch jobs or take a different career path during this time, and go over your credit report just in case there are any errors. Purchasing a home will most likely be one of the biggest purchases of your life and having someone dig through your financial history and credit history can make you feel vulnerable. A good lender should make you feel like there is a solution for you, no matter what your situation is. Sitting with a lender to move forward in your journey to purchase a home can be daunting and intimidating, but so long as you are well equipped with the right questions, you should not be blind-sided. These questions should help to eliminate the fear that you aren’t getting the best deal for yourself or that your lender isn’t thinking about your well-being.